Upper Deck is now showing off it’s upcoming The Alien Battles Vs. System Expansion. Upper Deck should be known to Alien and Predator fans are the publishers of the fantastic Legendary Encounters card games. They’re also responsible for the Vs. Systems 2 Player Card Game (2PCG) and the possibility of an Alien expansion of that system was talked about earlier 2015. “When compared side by side, Xenomorphs are better at fighting than humans. They are faster, usually bigger, and come standard with metal teeth and acid blood. The one constant that have allowed the Humans to stay competitive in a battle is their equipment. Vs System®: The Alien™ Battles introduces a new card type: Equipment. Players can play Equipment during their Recruit Step by paying its cost and putting it onto a face-up character on their side. It doesn’t matter if the character is Main or Supporting, ready or exhausted. Upper Deck previews The Alien Battles Vs. System Expansion due August . They have released two previews so far. The first is a brief overview of some of the core elements of the game and the second is a look a new card types to the Vs. System, Equipment and Creature cards. If you’re curious to learn more about the system, there are various tutorials on YouTube that can give you an insight into how the game might play. The expansion is standalone and doesn’t require a core game to play. If you haven’t already tried them out, the Legendary Encounter games are fantastic. The next expansion (focused on Aliens) is also due out in August and I do recommend giving the Alien and Predator versions a try. You can also check out our Legendary Encounters – An Alien Deck Building Game Review. GenCon is in full swing and they're running some VS. touries. They've posted some pictures of some cool playmats. This card has a typo. The 'You Want Some Of This' should require a Skill Location to activate. I've not checked YouTube yet but I imagine we'll be seeing some demo vidoes soon. Soon, so soon. Really looking forward to trying this out. Can you remind me what the Lethal keyword does? Couple more cards posted by the Facebook page. The VS System is an another game engine that is getting an Aliens themed update. And these are just cards, nothing to do with the game correct? Those are just a chase set for the Alien Anthology trading cards with artwork from the Legendary Encounters game. GenCon this weekend so hopefully we'll see some gameplay videos and more info. Can you guys give me some info on how this card game work? Is it playable for 1 person? Alternate art Queen GenCon promo. And a look at the Level 2 side of the Queen. This lovely alternate image lady will be making an appearance at Gen Con next week. Anyone participating in any of our Vs System 2PCG events will receive one. Apparently! Pretty sure they were eggs in Legendary Encounters. Just a strange change to make. Yeah that's what I was thinking. It's not like there is a trademark on the word egg lol. Maybe they just wanted to sound scientific. Probably not the route I would have taken for the chestburst plot twist. Upperdeck has given topdeckplayer.com spoiler to release tomorrow! Be on the look out! Thanks for the link, Grier. I can't wait to finally get my hands on it! 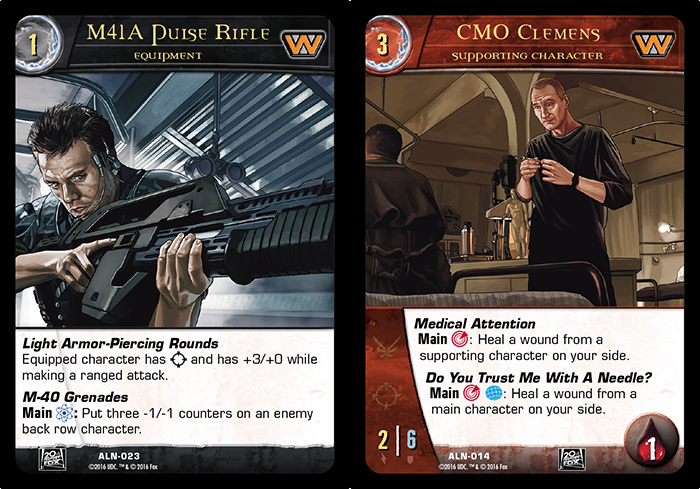 New preview is up: http://upperdeckblog.com/2016/07/vs-system-2pcg-the-alien-battles-we-always-have-a-synthetic-on-board/ It's about synthetics with spoilers for Call and Ash. Upper deck created a collectible card game called VS System 2PCG. The newest expansion called the Alien Battles is releasing at Gencon 2016. Check out the Spoilers below. Vs System 2pcg. Check out www.topdeckplayer.com the alien set comes out at gencon this year. I think it's more of an LCG than a CCG. The 2PCG is just a copyright spin on it, I think. Never heard of this CCG, though I've played Magic for many years now. Wonder what similarities there are between the two. But, it's has Aliens so I may try it anyway.